There has been so much demand on the topic of this chapter – the 10 MEGASHIFTS that will define the next 10 years – that we decided to release it as a single PDF; you can now download it below. Please note that the PDF is for your personal use only, and subject to copyright for all subsequent uses. If you enjoy the free chapter please consider buying the entire book – it is now available in 8+ languages (and more are coming soon). Read the latest reviews here. If you want to return the favour you can also write a nice review on amazon or @goodreads – both would be great ! Technological shifts are rewiring society and transforming the landscape. 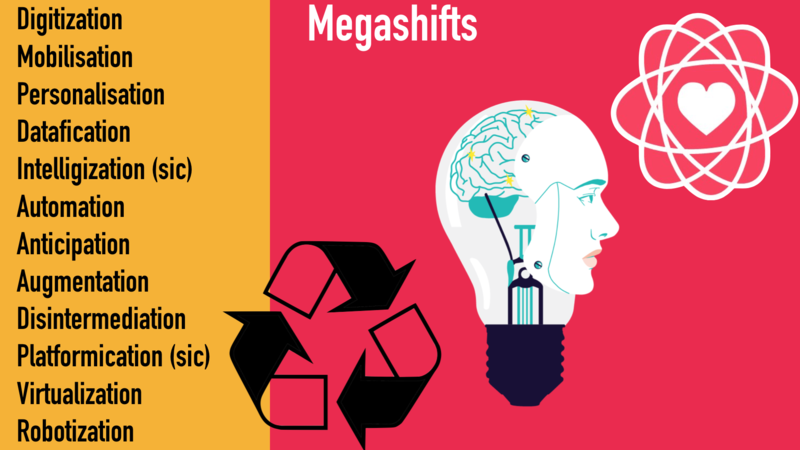 As a paradigm change is to thinking and philosophy, so a Megashift represents a huge evolutionary step for society, one that may seem gradual at first . . . but then has a very sudden impact. 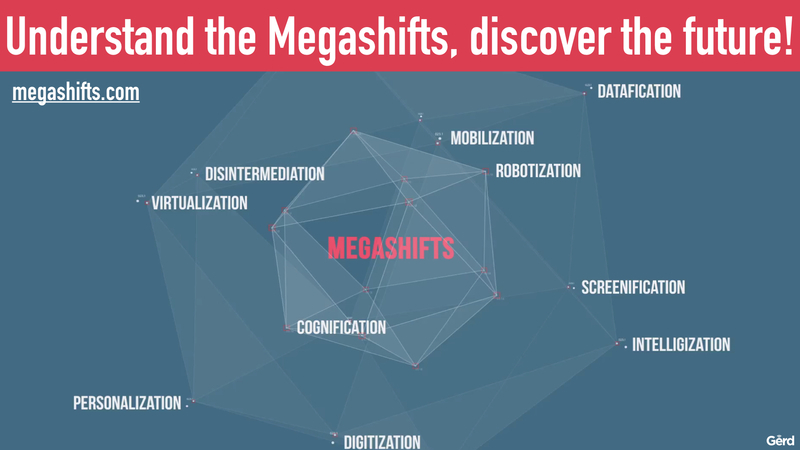 Below I explore the nature of these Megashifts and then go on to describe each of them and their potential implications. Many of the world’s great innovations were born decades, sometimes centuries, before they eventually swept through human society. They often occurred in a relatively sequential manner, each following and building on the previous ones. In contrast, Megashifts might grow slowly as well but many were born together. They have now started sweeping through society simultaneously and at a much faster pace. Everything that can be digitized, will be. The first wave included music, then movies and TV, then books and newspapers. Now it is impacting money, banking, insurance, healthcare, pharmaceuticals, transportation, cars, and cities. Soon it will have transformational impact in logistics, shipping, manufacturing, food, and energy. It is important to note that when something gets digitized and moved to the cloud, it often becomes free or at least vastly cheaper. Consider what happened with Spotify: In Europe an individual 12-song CD used to cost around €20 (US$22)—and now you can get 16 million songs for €8 (US$9) per month, or listen to them free on YouTube. While I am a happy and faithful Spotify subscriber and enjoy it very much, this kind of margin-destroying Digital Darwinism brings a huge shift in business models and forces most incumbents to transform or perish. In my 2005 book The Future of Music (Berklee Press), I discussed at length what seems to me a certainty—that the big record labels that controlled the music industry for decades will cease to exist because distributing music is no longer a viable business. Indeed, Sir Paul McCartney has famously compared incumbent record labels to dinosaurs wondering what happened after the asteroid. While that is an accurate image of the “psychic whiplash” being experienced by the established rulers of this once lucrative kingdom, it gives no indication of the speed of extinction. Crocodiles survived and some dinosaurs evolved into chickens—but digital Megashifts pay little homage to history and take no prisoners. In 2010, I coined the phrase “the people formerly known as consumers”; for them, digitization often means cheaper goods and widely improved availability. That’s generally a positive, but then again, cheaper goods can also mean fewer jobs and lower wages. Witness the digitization of mobility with Uber and its rivals around the world like Lyft, Gett, and Ola Cabs in India. We can now order a taxi ride using an app on our smartphone, and it will often be cheaper than the incumbent competition. But will this economy work for the taxi drivers in the long term, or are we heading into a Darwinian “gig economy,” a situation where we all work a multitude of relatively poorly paid freelance gigs rather than regular jobs? 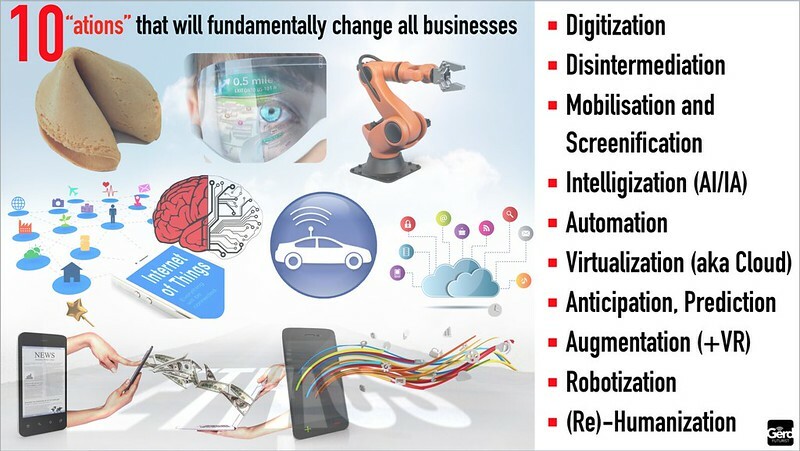 Regardless of societal challenges, the rapid digitization, automation, and virtualization of our world are probably inevitable. In practice, the rate may sometimes be constrained by fundamental laws of physics such as the hereto unmet energy needs of supercomputers or the minimum viable size of a computer chip—often cited as the reason why Moore’s Law will not prevail forever. This assumption of continued and pervasive penetration of technology points towards a future where what cannot be digitized and/or automated (see Automating Society, chapter 4) could become extremely valuable. 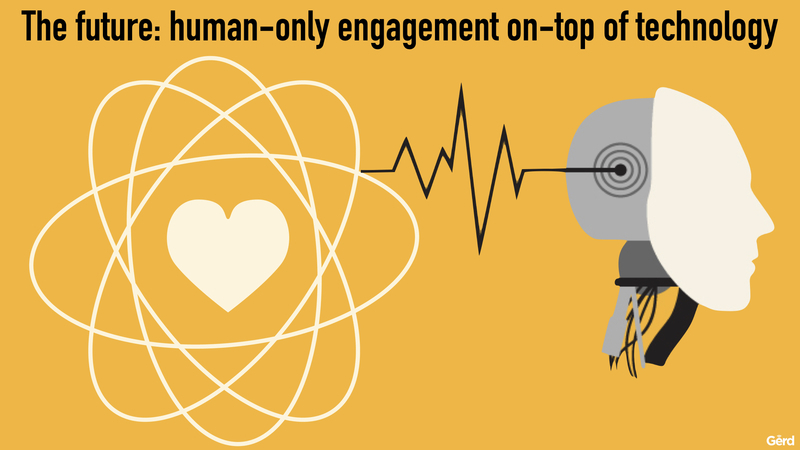 As discussed in chapter 2, these androrithms capture essential human qualities such as emotions, compassion, ethics, happiness, and creativity.